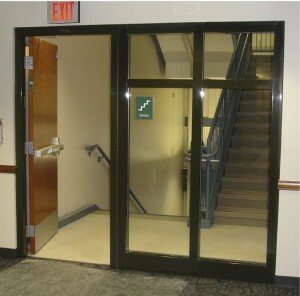 What are the code requirements for fire-rated glazing in 1- and 2-hour exit/stairwell enclosures? Click here to view aÂ pdfÂ of code requirements for fire-rated glazing in 1- and 2-hour exit/stairwell enclosures. The codes specify extra fire protection levels for fire doors in exit enclosures and passageways, requiring the use of doors that limit temperature rise to 450F degrees.Â In the 2000 IBC, an exception was provided that allowed the use of non-temperature rise doors if the building is fully sprinklered in accordance with Chapter 9.Â But what about the glazing in the door? The 2012 IBC has been amended to clarify that the maximum allowable vision panel in a 60-or 90-minute exit enclosure or passageway door is 100 sq. inches, regardless of whether the building is fully sprinklered or not, unless that glazing product is fire resistive, like SuperLite II-XL, to limit temperature rise and block radiant heat. What 2012 IBC code provision 715.4.4.1 makes clear is that traditional fire protective glazing products, such as wired glass and ceramic materials, are limited to 100 sq. inch vision panels in 60-and 90-minute exit enclosure or passageway doors.Â Where larger glazing panels are desired to bring light into the enclosure, fire resistive products, like SuperLite II-XL, that limit temperature rise and block radiant heat are permitted. For the same reason that vision panels in fire doors used in exit enclosures are limited to 100 sq. inches, it is important for architects to understand that fire protective wired glass and ceramics are not permitted at all in other openings in an exit enclosure, including sidelights and transoms, or fire windows. 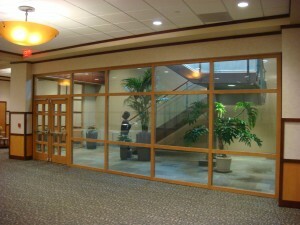 Again, where glazing is desirable in greater amounts in exit enclosures, fire resistive products are allowed around and over the door, and in other openings, provided the glazing is installed in a fire resistive framing, and the whole assembly meets the same rating requirement as the wall. 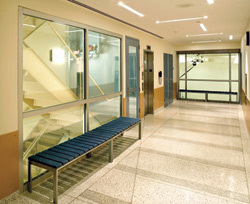 2-hour exit/stairwell enclosure providing vision and security with fire resistive glazing and framing that blocks radiant heat.Â The Reece School, New York City. 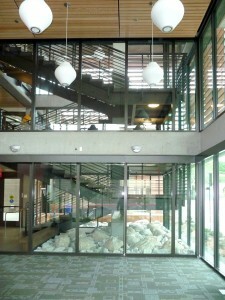 Sidelites and transoms adding light and security to a 2-hour stairwell at Ohio University. Products used: SuperLite II-XL 120 in GPX framing.Â Both products are fire resistive, block radiant heat, rated 120 minutes with hose stream, have impact safety rated to Consumer Product Safety Commission Cat II, and meet ASTM E-119. Products Used: SuperLite II-XL 120 in GPX Framing (walls) and SuperLite II-XL 90 in GPX Framing (doors).Â Per the architect, the GPX Framing has a wood veneer finish to match all the non-rated systems used in the hospital.